Happy Saturday everyone! 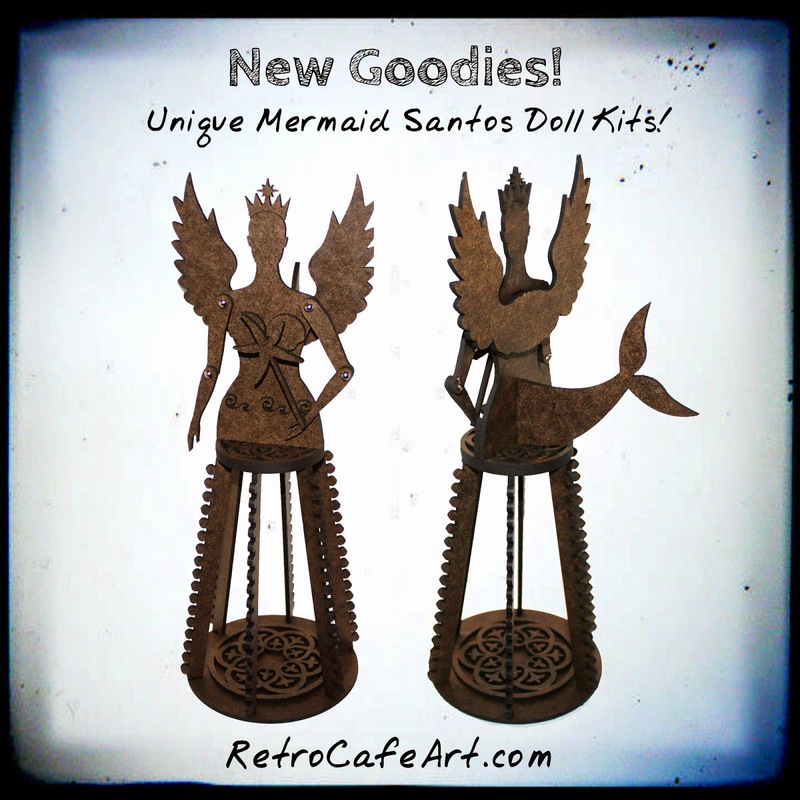 I'm beyond excited about our brand new Mermaid Santos Doll Kits! Yes, you heard me right! Two of my favorite things, combined to make a stunning, unique doll, that you won't find anywhere else. Just for the heck of it, I Googled "Mermaid Santos" and nothing came up. How cool is that? 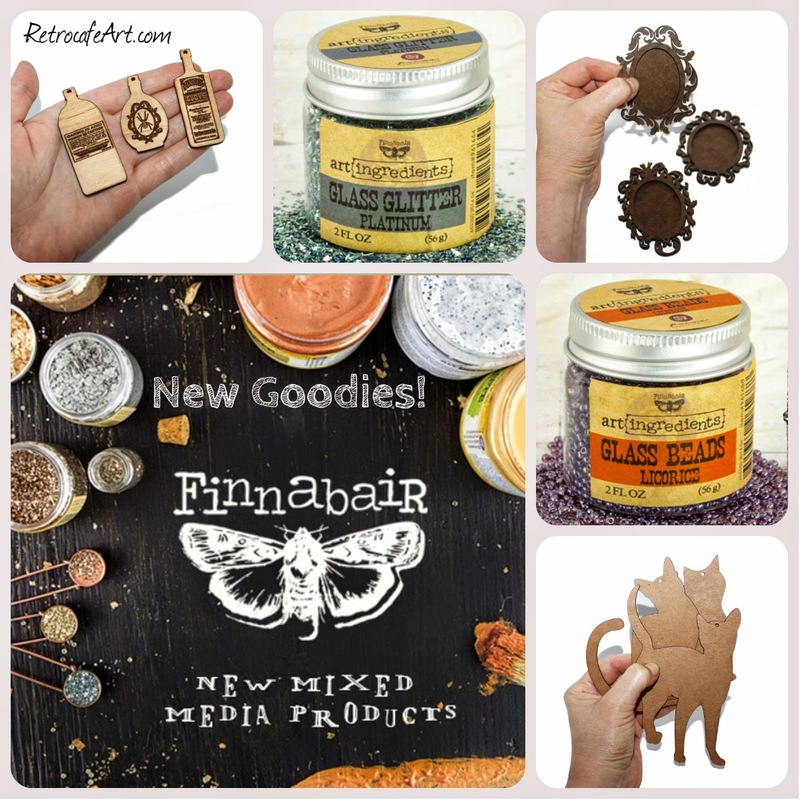 And don't forget about our awesome new Prima Finnabair goodies from last week. They look delicious! Mermaid Santos Inspiration By Lisa Rupp! 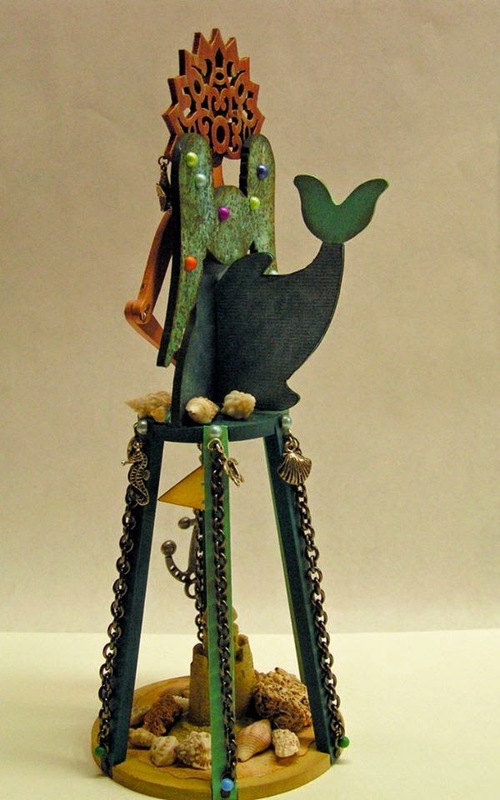 Lisa Rupp is largely behind the inspiration for our new Mermaid Santos Doll Kits. 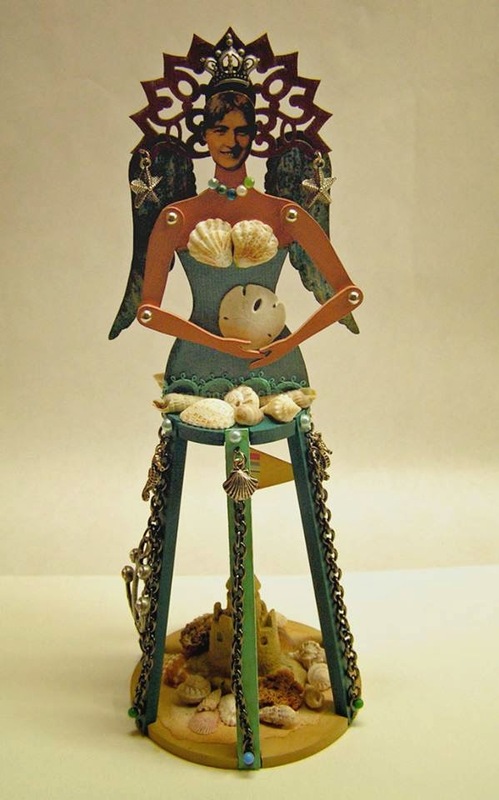 Using one of our other Santos Doll Kits, Lisa created this amazing Santos Sea Maiden. When I saw Lisa's doll, I knew what had to be done! Our Mermaid Doll Theatres were also part of the inspiration and would look great with the Santos! 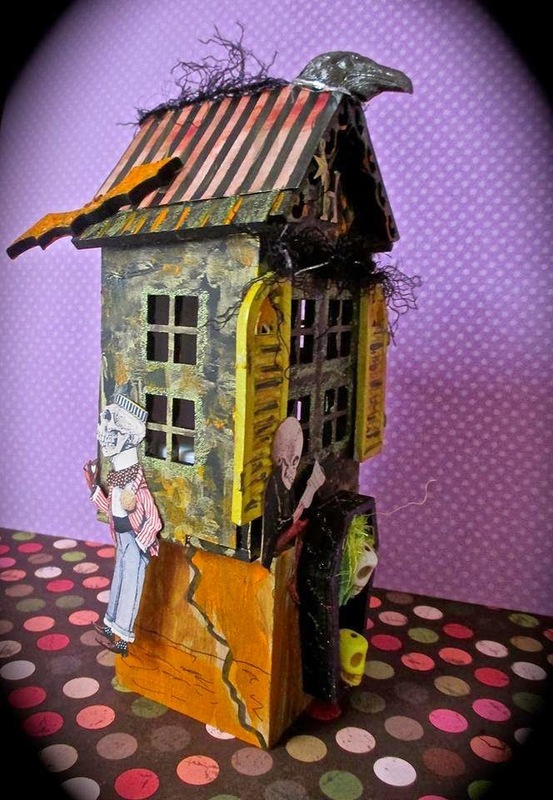 "Haunts Ville" by Bonnie Ashust is certainly a hoot (pun intended!). 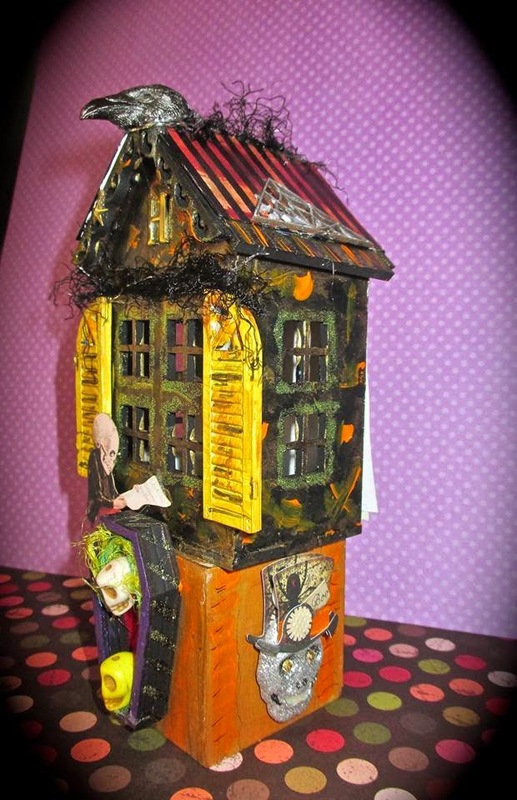 Bonnie used our Votive House Style 6 plus TONS of other Retro Café Art Halloween goodies for this impressive haunted house. So creative Bonnie! These STUNNING Steampunk Santos Dolls by Linda O'Connor may give you some great ideas for altering the new Mermaid Santo Dolls! 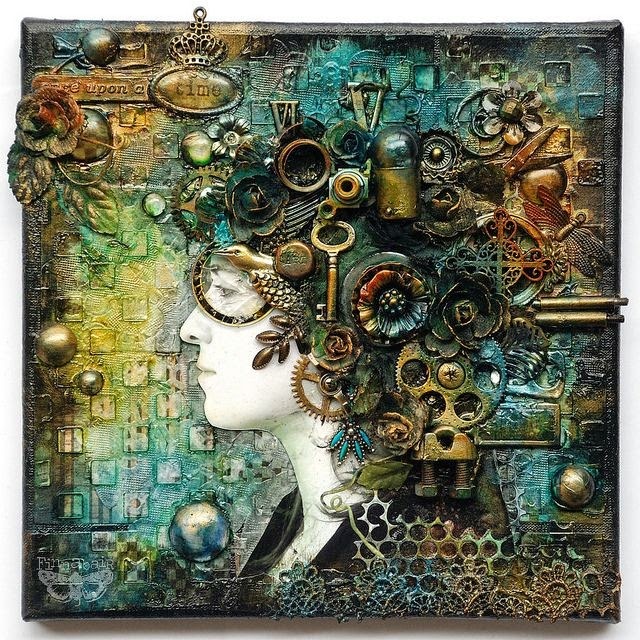 Linda O'Connor is amazing when it comes to adding found objects to pieces. You can read more about her wonderful dolls and view more photos HERE on her blog! Awesome Linda! 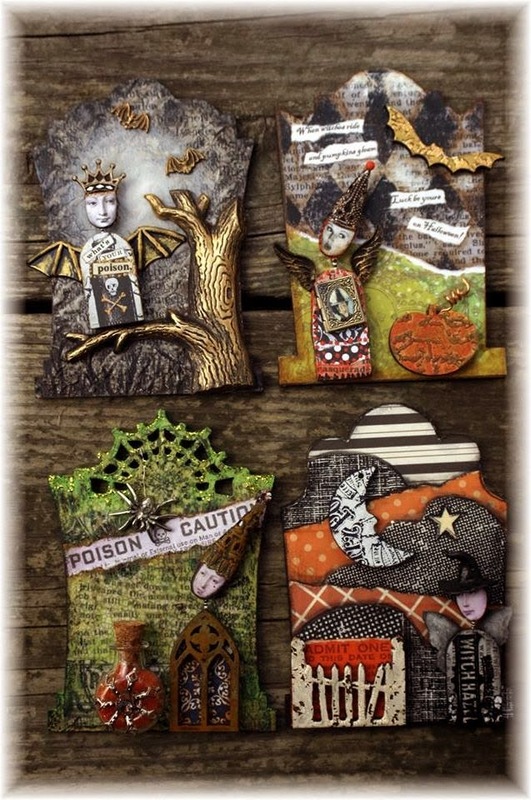 Design Team Member Lynn Stevens created these charming Halloween treats, mostly out of dominos and Collage Sheet DP282. She used several of our Halloween Charms too. Such a wonderful grouping Lynn! Anyone would be super lucky to get a treat like this! 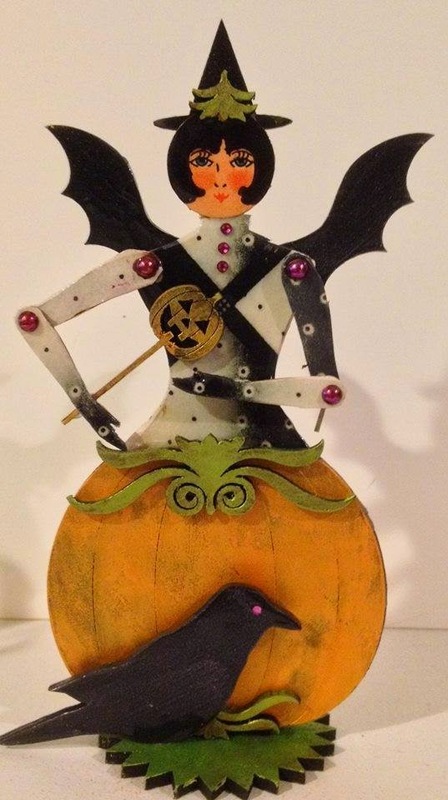 Diana Darden created this sassy Victorian Pumpkin Doll! I love the face she used and the Mysterious Bird was a great touch too. Not to mention the wonderful flow of her color palette. Lovely Diana! 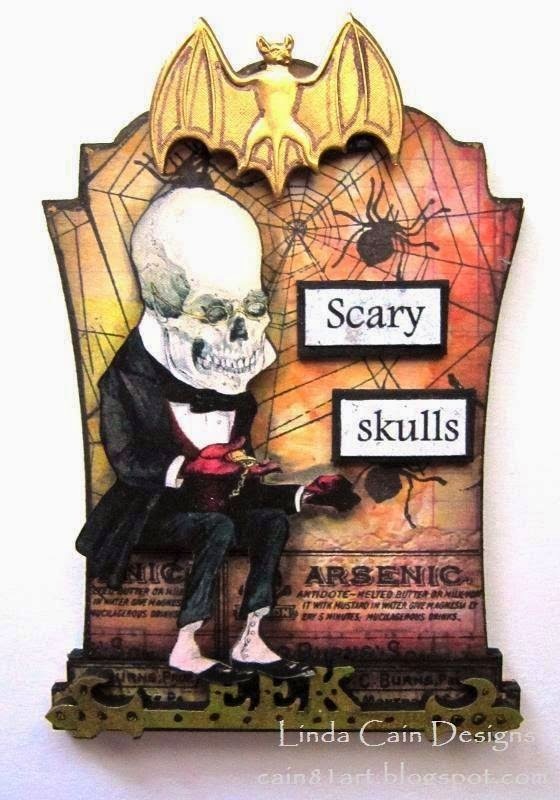 Don't forget, Tombstones for the Art Swap are due October 6th. That's a week from this coming Monday, so you should be getting them in the mail soon if not already. I've started to add the received Tombstones HERE on Facebook. Really awesome work so far! 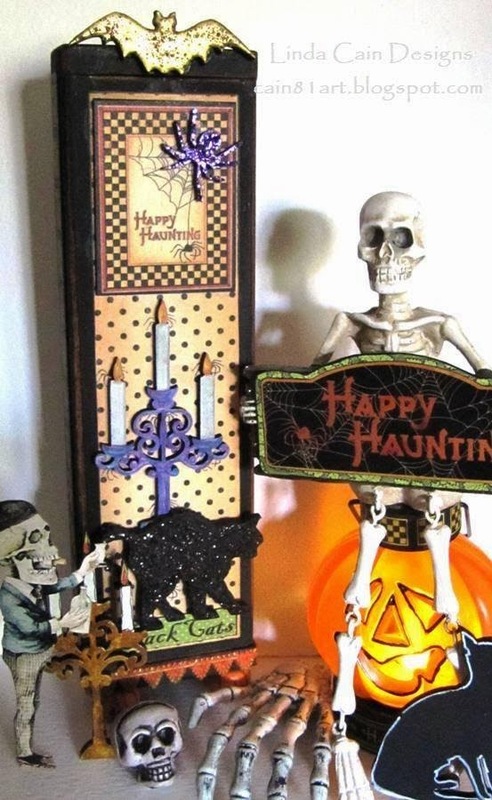 The fabulous tombstones above are by Mary Jane Chadbourne! And below you can see I've started to work on my handmade gift for the swappers! Those aren't cookies on my baking sheet! As promised I'm showing you my finished studio "nap nook". My final step was to hang a set of seven different shaped/sized mirrors. As a perfectionist, I can also be a procrastinator. If I'm not sure I can get the job done right the first time, I often wait! So sorry this took me so long! I wanted to get it right the first time, so this is what I came up with. 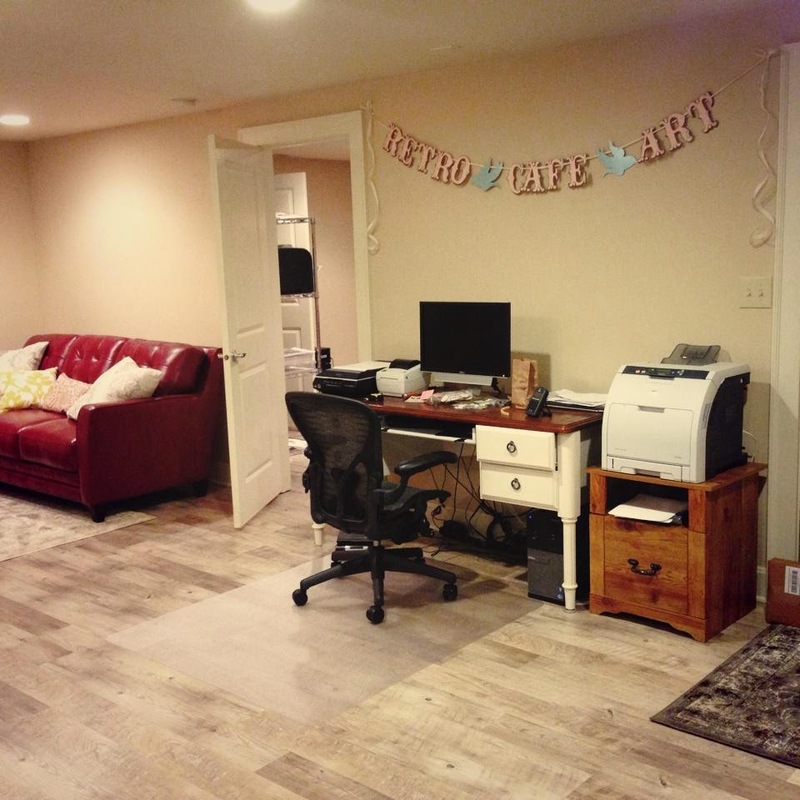 I taped two large sheets of packing paper together about the size of the wall space I wanted to fill. The seven mirrors are different sizes and shapes and none of them have the hook in the same place so I couldn't just start hammering into the wall (unless I wanted tons of holes. nope.) I played around with the placement, and once I was satisfied, I traced around the mirrors loosely with a pen. Next I picked up each mirror and measured the distance from the top to the hanger. I took that measurement and I added the nail holes with a pen to my "drawing". I hung my drawing on the wall and moved it around until it was exactly where I wanted the mirrors. While this was still hanging, I took a nail and made some small pilot holes, hammering into the paper, just enough so I could see where to hammer my nails. I removed the paper and hammered in my nails. I had purchased some fancy picture hangers from the store, but the weren't going to work so I went with regular nails. Remember to hammer them in slightly at an angle so they don't fall right out. Even though the mirrors are somewhat random, they have a nice "balance". At least my perfectionistic, somewhat OCD brain thinks they do! I'm so happy with the way it turned out. My first stab at actually decorating an area. I love a mix of modern and vintage. Hopefully that's what I achieved! All we have left to do is mount the tv to the opposite wall. Since the tv is square, I thought the mirrors would be a nice balance, so things didn't look too "boxy". Next up is the studio bathroom. Happy Saturday everyone! I'm super excited to let you know that we now have the Prima Finnabair line IN STOCK and to ship. There are so many amazing products in this line, that I can't pick a favorite. We also have amazing engraved Apothecary Bottles, Baroque Frames, and some large Cat Tags just for fun! The Tiny Fairies from last week are still on my favorites list too. 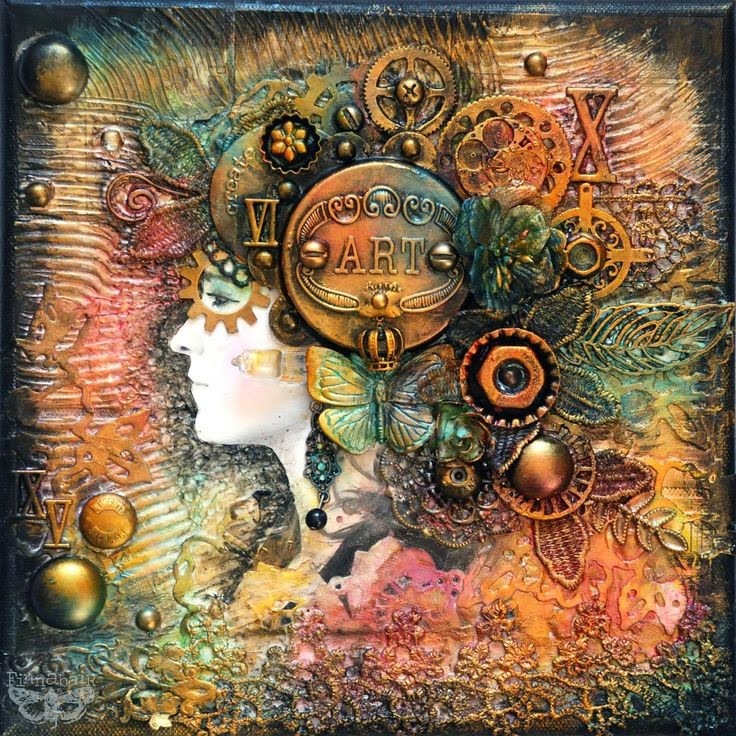 Here are some fabulous mixed media pieces created by Anna Dabrowska, aka Finnabair! Her pieces are gorgeous. Full of amazing color and texture, just like the Finnabair line! Are you excited about the new goodies yet? I know I can't wait to create! This fabulous Halloween extravaganza is by Design Team member Linda Cain. I love how she used her finished Halloween box and other goodies to create an entire display. You can find more fabulous photos on Linda's Blog! 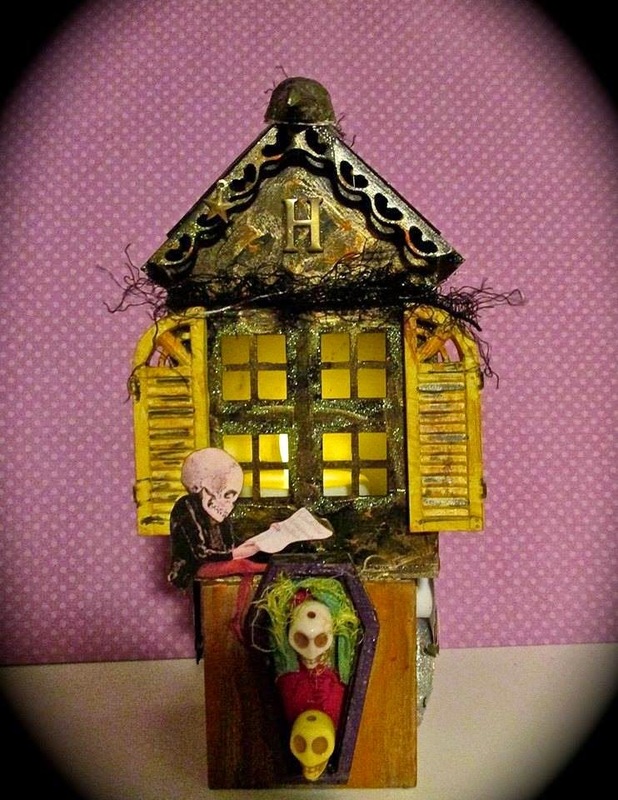 I adore how Tracy Delisle turned our China Doll Shrine into this adorable Witch! The Witch Hat Cut-Outs, Dried Pumpkins, Skull Beads, Spider Webs, and Dome Bottles were the perfect touch. Such a sweet little Victorian Witch Tracy! Great idea! 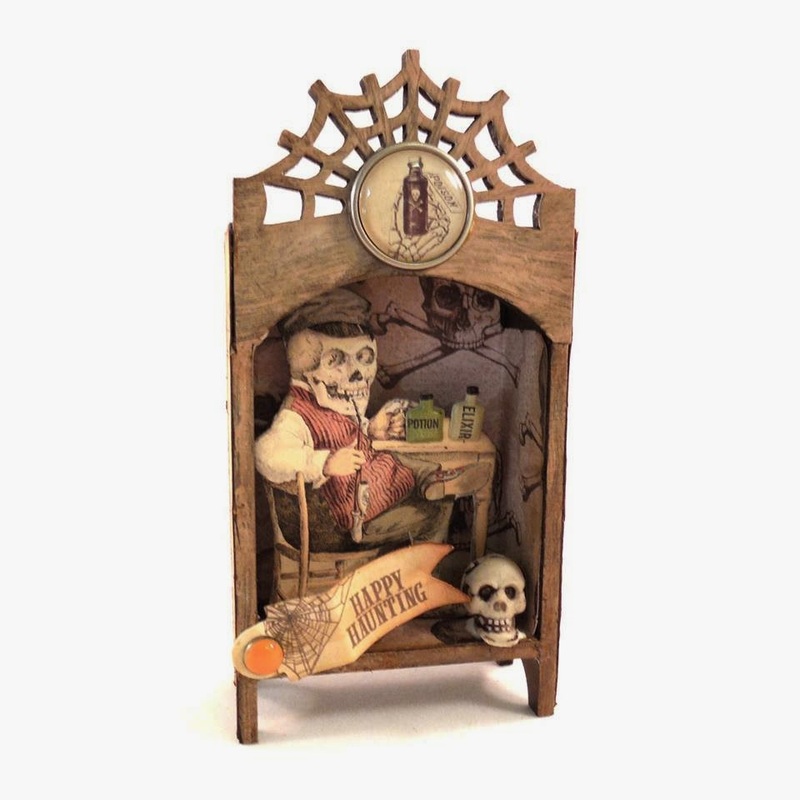 Design Team Member Lynn Stevens created this fabulous Small Halloween Hutch Shrine Kit. Mr. Skeleton looks quite happy and a bit mischievous in there. Spooky cool creation Lynn! Diana Darden created this amazing Steampunk Santos Doll. The addition of the Large Flip Frame is my favorite part. And of course the goggles from the kit. Stunning Diana! Happy Saturday everyone! This week we have something extra fun. Our Inspiration Fairies that you know and love gone TINY! They are under 2", and they are adorable! 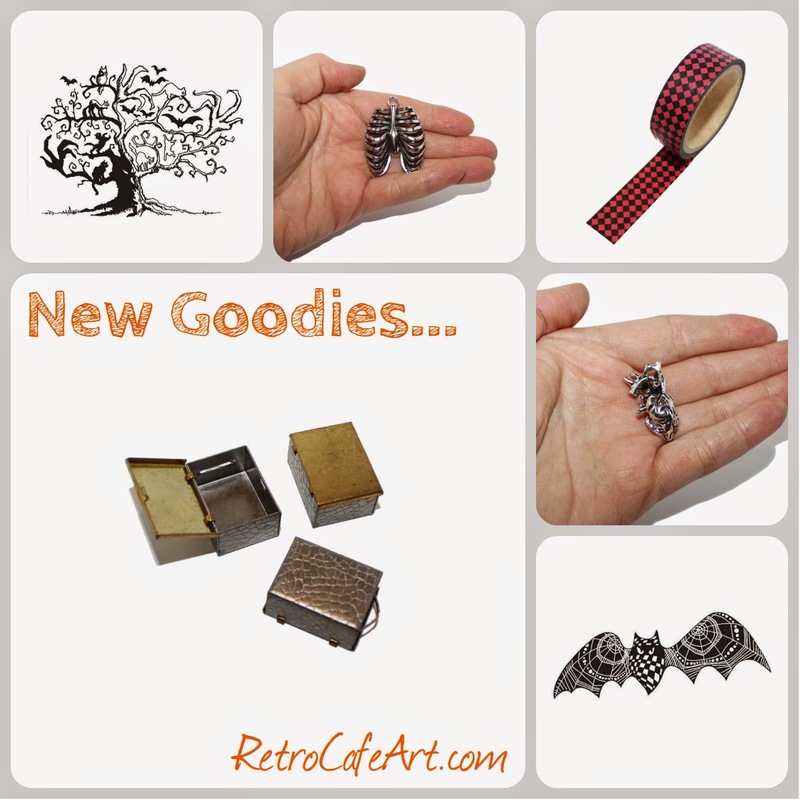 We have some fun new Halloween goodies in the shop, as well as a few new Tim Holtz Stencils too! 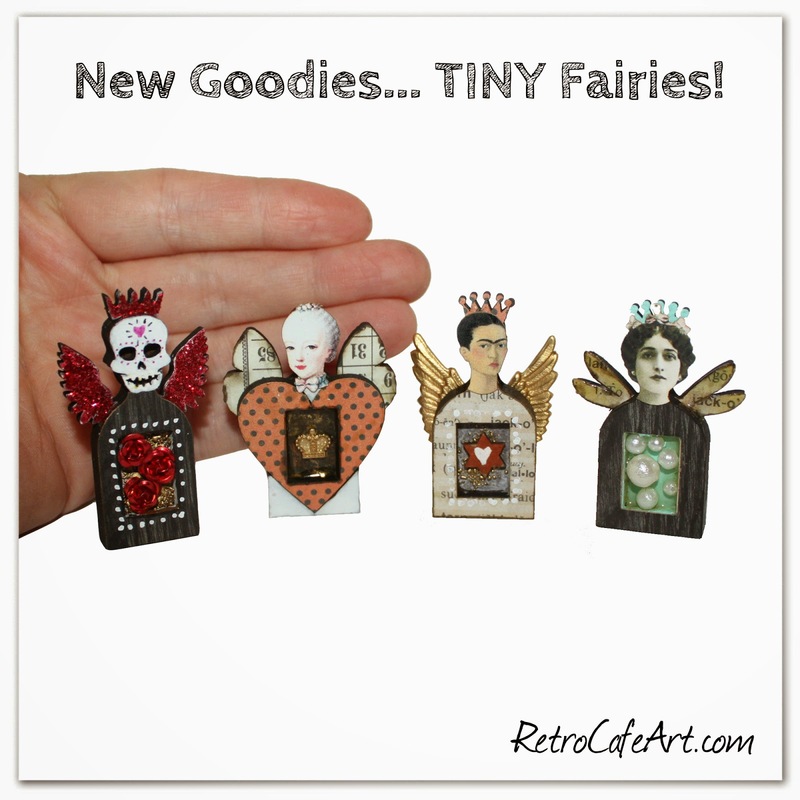 The new Tiny Fairies are totally addicting, so you may want to grab a few sets. The Tombstones below were created by the talented Sherry Matthews for our Art Swap. 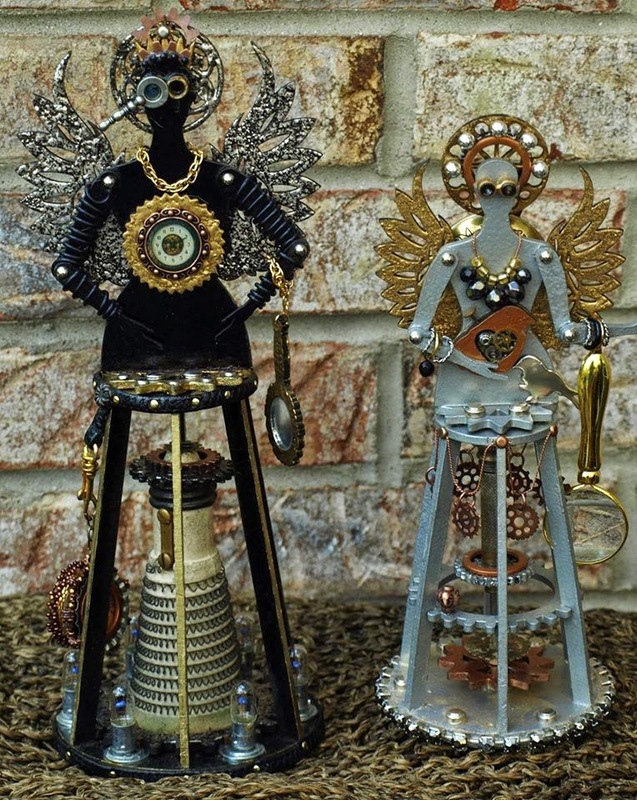 I immediately fell in love with the TINY dolls she made using our scrap bits, and I knew then that the Inspiration Fairies NEEDED to become TINY. Thanks for the inspiration Sherry! You definitely started something awesome! I had a blast creating my Tiny Fairies and I can't wait to make more. I may turn a few of these into pins. The Tiny Fairies are a GREAT way to use up those scrap bits and tiny trinkets that you have lying around. Here is a size comparison of our original Inspiration Fairies and the new TINY Inspiration Fairies. They are even smaller in person and oh so cute. Does anyone remember Micro Machines from the 80s? Yeah, it's kind of like that! 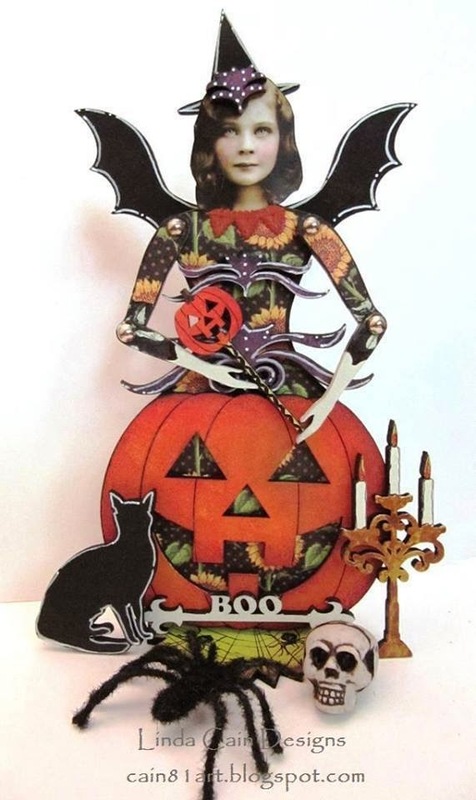 Design Team Member Linda Cain created this fantastic Victorian Pumpkin Art Doll. I love all the embellishments she added, and the sweet face with piercing green eyes was the perfect selection! You can read more about this wonderful piece and find the full supply list on Linda's Blog! 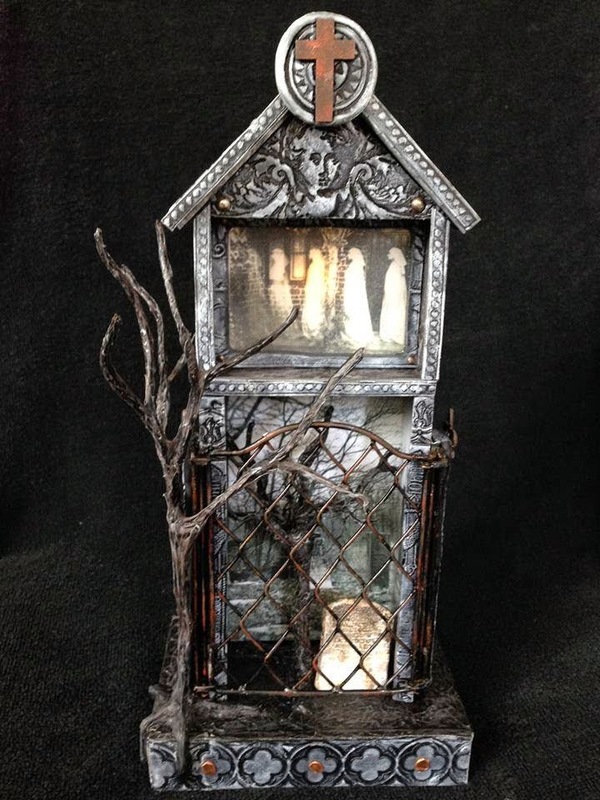 How cool is this Tower Shrine by Sylvr Sharp! The textures are just blowing me away. And oh my, that tree is incredible! This is one awesomely spooky tower. 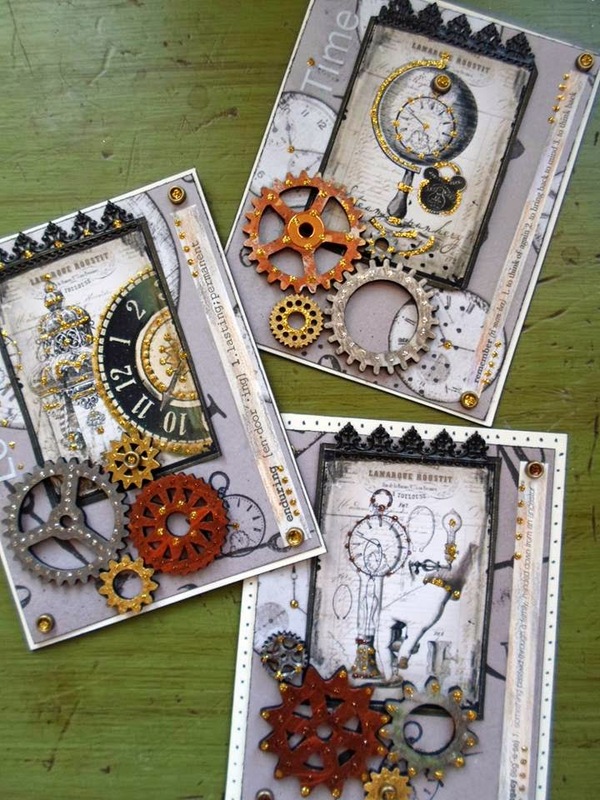 These fabulous Steampunk cards are by Design Team Member Gerri Herbst. 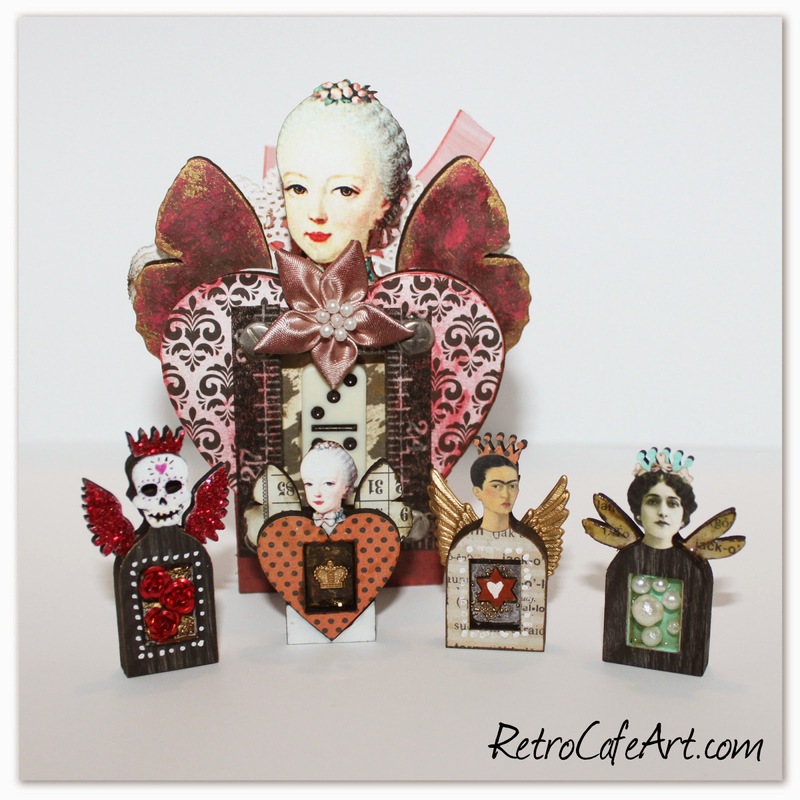 She used our Gear Cut-Outs as well as our Steampunk ATC Background Collage Sheet. 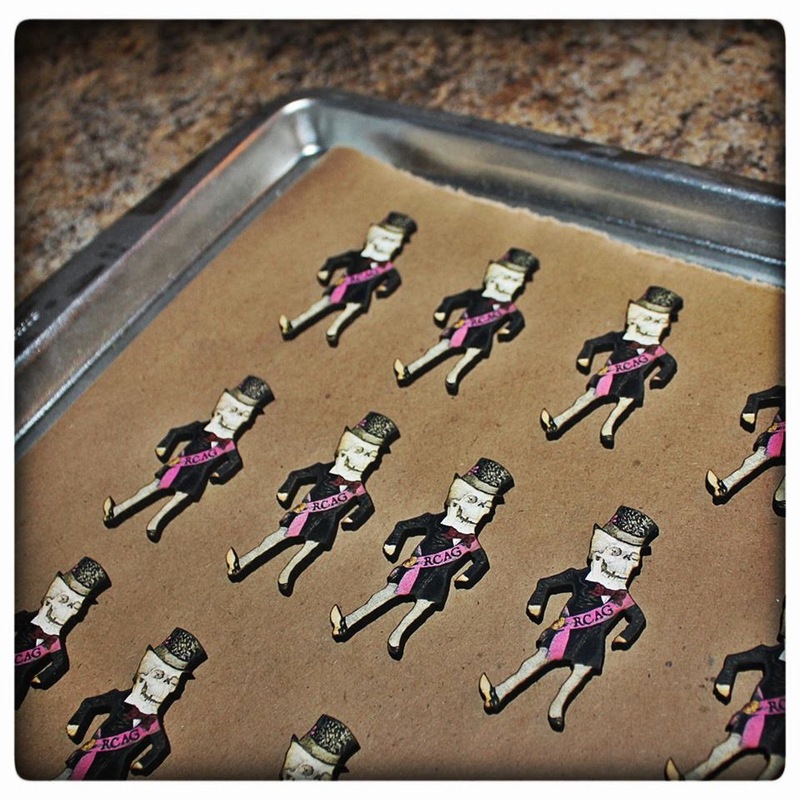 And of course the Black Dresden and Stickles accents were the perfect touches. Amazing work Gerri. They look like they came straight out of a Steampunk magazine! 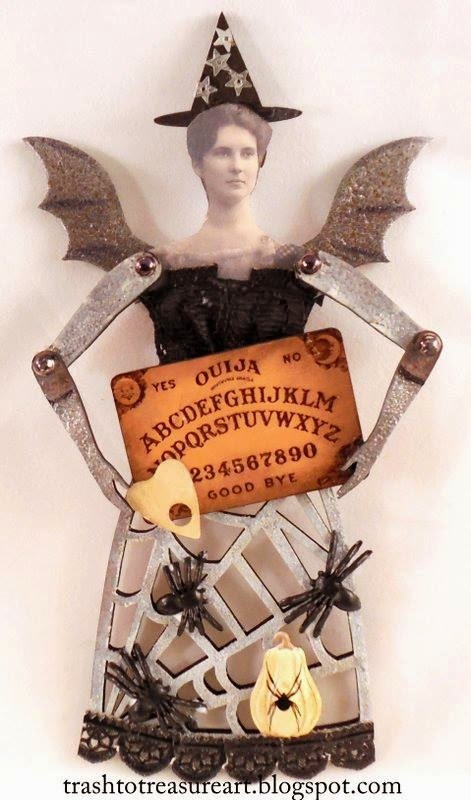 This fabulous Ouija Board holding Witch is by Design Team Member Lynn Stevens. She looks like maybe she's pondering her question! And I'm loving the color scheme. Wonderful creation Lynn! 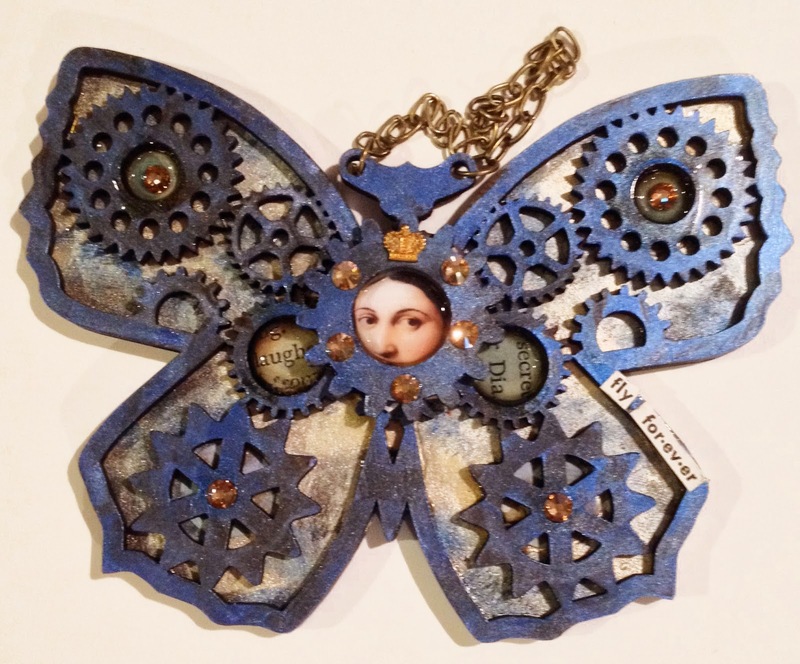 Diana Darden created this beautiful blue Steampunk Butterfly. The Santos Head Paper Cut peering through is the perfect touch. And I love the sentiment "fly forever". Gorgeous Diana! The talented Sherry Matthews sent me a fabulous vintage image, as well as her amazing "Hocus Pocus" hand painted version to share with all of you. I turned them into this Digital Collage Sheet, and I can't wait to see what you create! The painted image by Sherry is based on the movie Hocus Pocus. Always a Halloween favorite! And if you are familiar with the movie, you'll see she created an amazing resemblance! 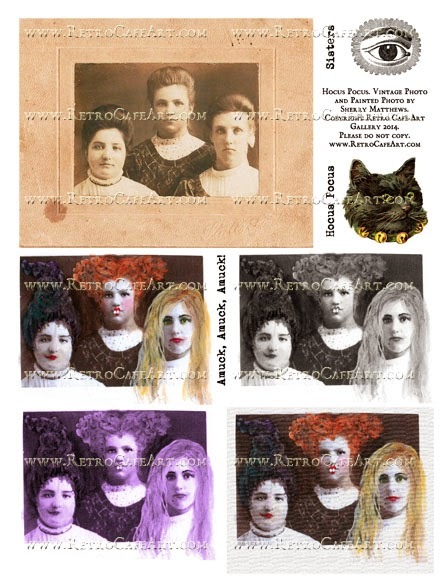 You can download your FREE Digital Collage Sheet HERE. Thank you so much Sherry Matthews! 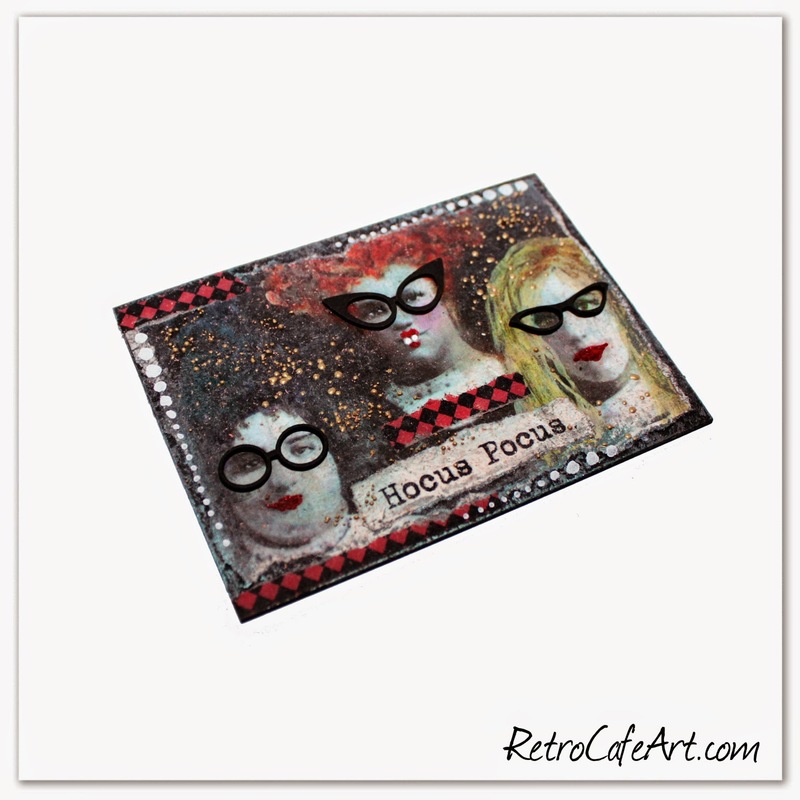 Earlier in the week I stopped in the middle of packing orders to make this quick 15 minute ATC. Because sometimes you just have to play. And that FREE Digital Collage Sheet was staring up at me. Literally. In addition to the Free Collage Sheet, I also used our Black Mat Board ATC Base, Matte Glue N Seal, Gold UTEE, Turquoise Inka Gold, Graphite Inka Gold, Diamond Washi Tape, White Sharpie Paint Pen, and Glasses Cut-Outs. Just tear out the images from the Collage Sheet, attach with Glue N' Seal. Tear and attach some Washi Tape, rub on some Inka Gold, Sprinkle on some UTEE, melt. Finish off with glasses and some Sharpie accents. Happy Saturday everyone! We have even more wonderful Halloween goodies in the shop. I can't get enough! The anatomy charms are of course my favorite. They are nice, heavy, high quality charms that are large enough for pendants, but also perfect for altered art and assemblage. We also have a few new Halloween Washi Tapes and several amazing stamps! 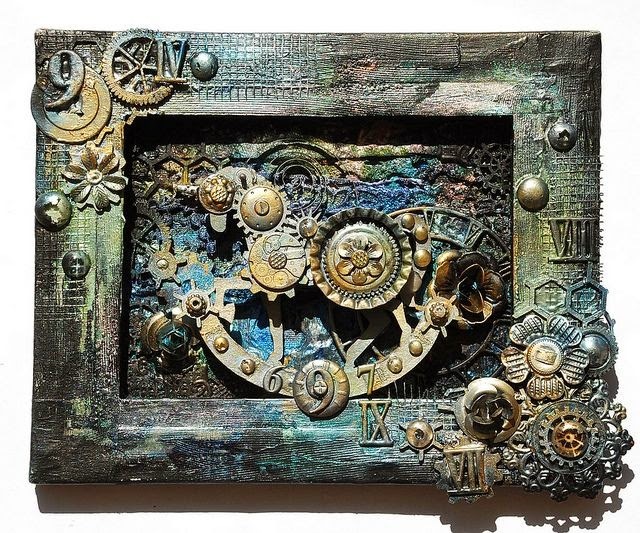 Design Team Member Linda Cain has been cooking up some wickedly cool pieces in her art lab. 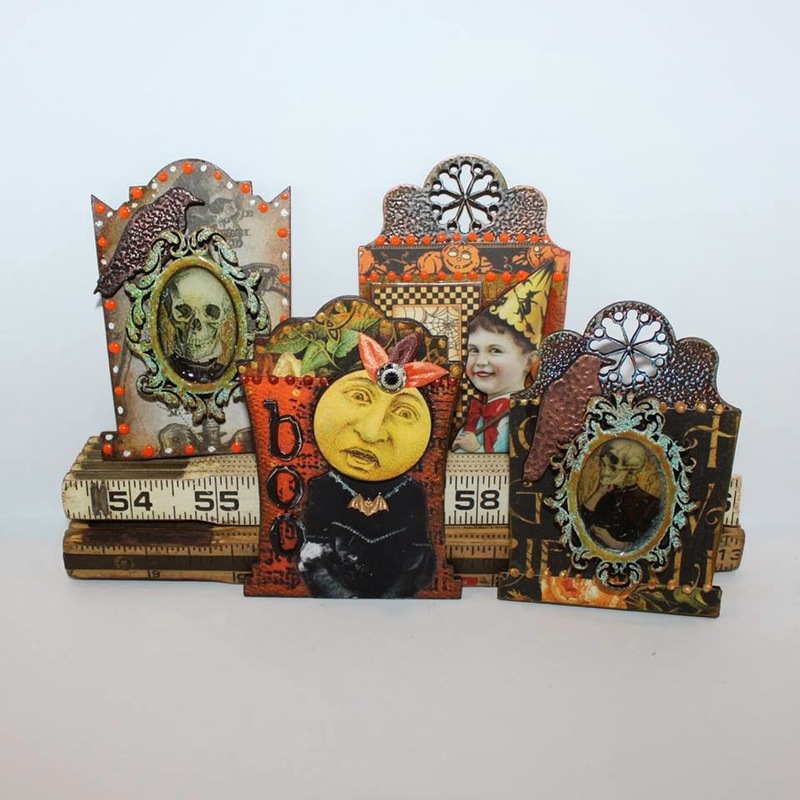 Check out her blog post HERE to see all four of her fabulous Tombstones for the Art Swap! Tons of inspiration! Tombstones are due October 6th so you have just over a month! There's still time to join in! Inspiration By Vickie Kammerer and a CONGRATS! A HUGE congrats to artist Vickie Kammerer for her wonderful project article in the current Stampington & Company Somerset Holidays & Celebrations magazine, on the newstands NOW! 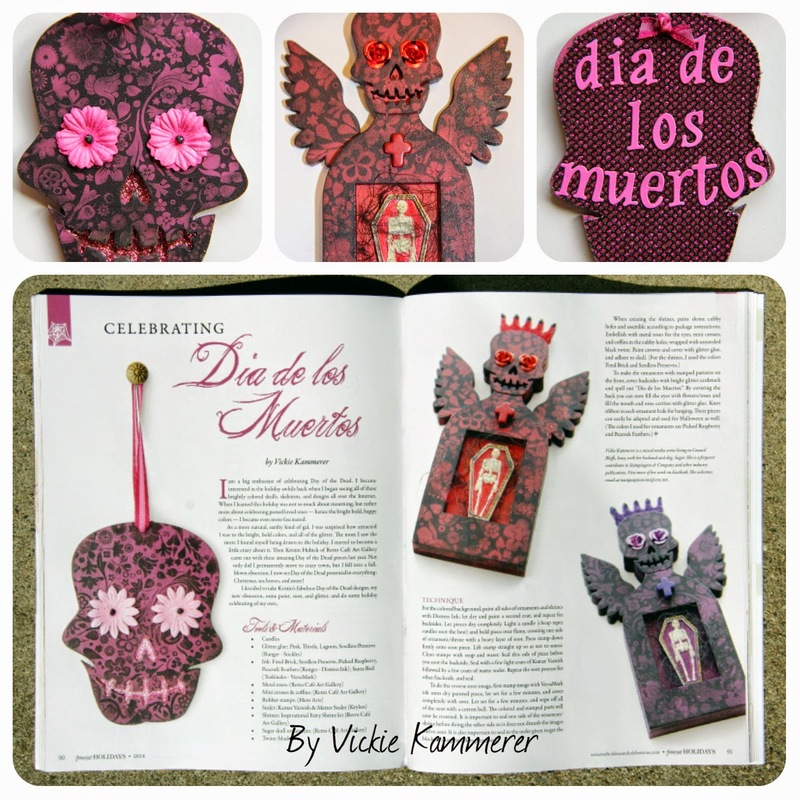 Vickie used our Sugar Skull Ornaments, DOTD Fairy Shrine Kits, Metal Roses, and Coffin Cabochons in her projects, and we couldn't be more honored. 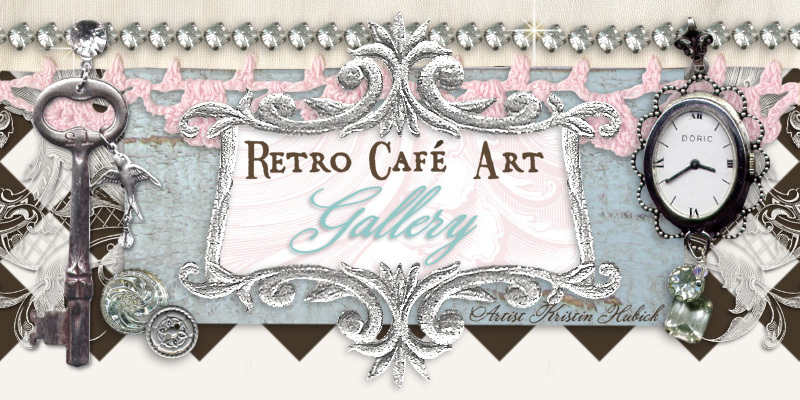 She even mentioned Retro Café Art Gallery and Kristin Hubick in the text of her article. We are truly blushing over here! We are also so proud of Vickie for helping Dia Del Los Muertos get some of the exposure it absolutely deserves. Fantastic Vickie! Go get your copy. You won't be sorry! This amazing "Scary-Go-Round" is by Design Team Member Lynn Stevens! In addition to our 3-D Carousel Shrine Ki with Chipboard Top, she also used our Banner Cut-Outs, Skeleton Paper Cuts, Spider and Web Cut-Outs, Bat Cut-Outs, and Tim Holtz Autumn Tinsel. "I hand painted one horse then took photo copies and cut out and glued onto the rest of them". What a time saver and fantastic idea from making them uniform! You can read more about this wonderful piece on Lynn's blog.